Storage Container for LSV or VLX? Does anyone know where to find one of these? Would I have to order one through my dealer? How much? I would buy one of those for a reasonable price too! put your clothes in there before going on a set in the fridged waters up here. They come on the '06 models. Yes, I have one & yes, it keeps things inside warm. It's not terribly deep though, so we found it to be a good spot to put handles, lines & flags. Check with your dealer on cost - I would think that it would fit your boat. Thanks for the help everyone. I emailed our dealer. I'll let you all know what they say. Guess I won't be calling you for my new years day run. That's a nice idea. Looks like that could be a DIY project. Sarrrcasm, naw the water is probally better at anderson that most anywhere else this time of year. Hey, that's super cool. I want too! And Pete - you better call me! My understanding is they have them in the 06 because the new v-drive transmission they have is smaller and leaves a bit more room. I think for earlier models you would have to make something yourself? Possibly, I don't know. If you guys would like some pics, let me know. The seat bases in the '06's have been altered to get these trays to fit. According to Malibu, it will not work in your '05. Sorry. You would think it would fit, but I guess not. Can someone hunt down one of these at The Container Store?! if anything it might actully be wider? i am looking at the cushion placement in refrence to the curve in the vinal. Chris, I think the concern isn't the size of the hole in width or length. It's the depth. 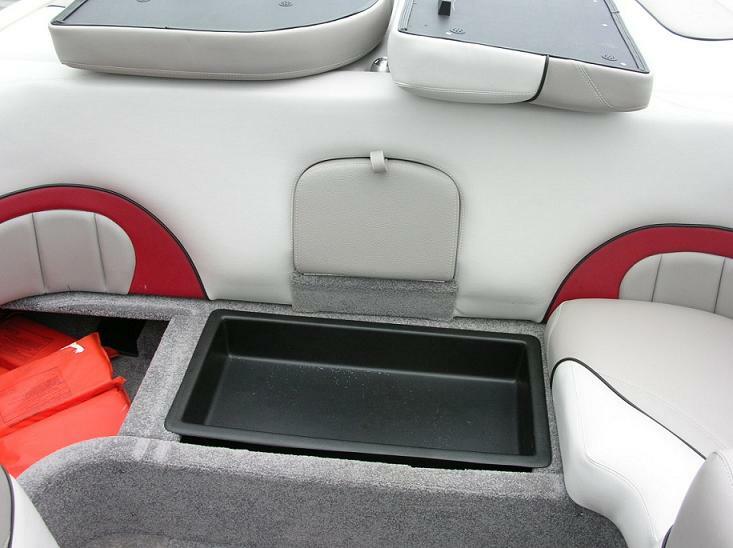 Theory is that the new V drives (under the seat cushion) are actually smaller - take up less room. 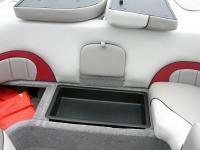 So there's room for a little rubbermaid dealie under the seat. There probably isn't room in yours or mine. But I'm going to look anyway.